For many of us, acne results from sweating. All that perspiration moves dirt around your skin and the oil present in sweat can clog your pores. Although we sweat more during the summer than we do in the winter, that doesn’t mean that we aren’t at risk for acne during colder months. Acne can strike at any time, so it’s best to be prepared. Here are 5 helpful tips for winter acne relief that help you fight breakouts like a pro! Clear skin by the holidays? Yes, please! Raise your hand if you drink far less water this time of year than you do during the summer. Yes, we’re all guilty of it. When we aren’t feeling hot, we just don’t crave water as frequently, but it’s still a must. Drinking your eight glasses flushes toxins out of your body while fighting against dry skin. The holidays are definitely a time of treating yourself, and it can be easy to go overboard. With all the holiday-themed cookies and delicious, savory foods being passed around the dinner table, your risk for breakouts increases. Dairy products have been known to aggravate acne, so swap in olive or grapeseed oil while cooking when you can. If you saw a pesky pimple making an appearance in the summer, you probably treated it with a harsh spot treatment, or maybe you popped it. (Gasp!) Now’s not the time to use those treatments. Dry air + drying skin care products = skin drier than the desert. We recommend introducing a few products that are kind to your skin but tough on acne, like our Clear Face line. Everyone loves a hot shower after a long day, but unfortunately, your skin begs to differ. Hot water can dry your skin out even further, leading to itching, peeling, and all the unpleasantries that come along with severe dry skin. Switching to lukewarm water helps you relax, but doesn’t strip your skin of the moisture it needs. 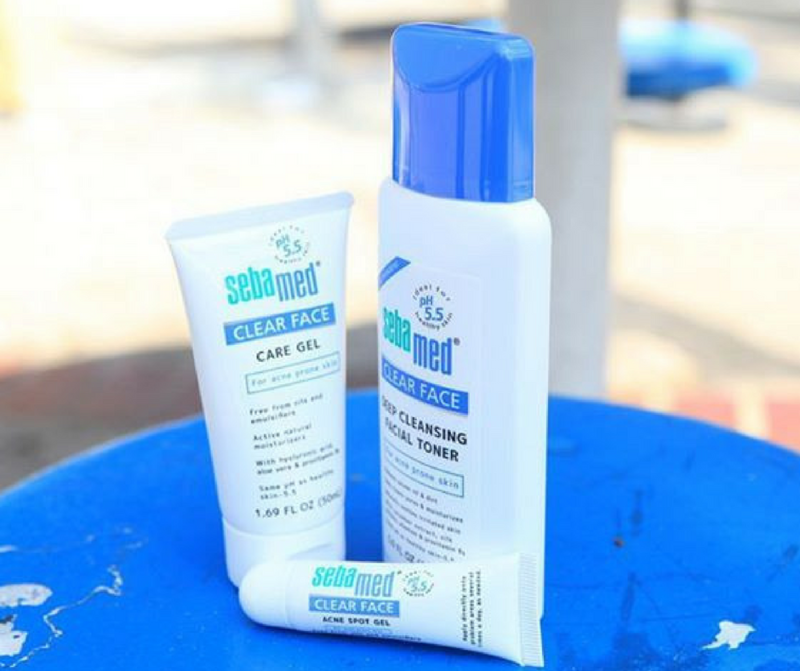 Whether your acne has taken a turn for the worst or you just get the occasional zit, Sebamed can help with winter acne relief. Our products promote healthy, clear skin with every use. Check out our full line-up here.